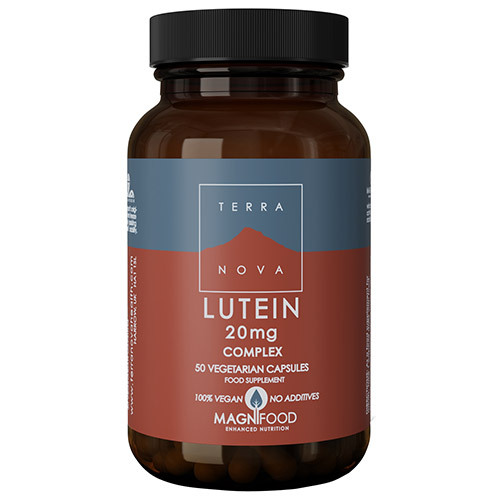 Lutein Complex with MAGNIFOOD blend including Kale, Bilberry, Watercress, Sea Buckthorn Berries & Rosemary with Lipoic Acid. Kale (fresh freeze dried), Bilberry Fruit (fresh freeze dried), Watercress (fresh freeze dried), Sea Buckthorn Fruit/Leaf (fresh freeze dried), Rosemary Leaf (fresh freeze dried), Vegetarian Capsule Shell (hydroxypropyl methylcellulose), Lutein (from marigold flower), Alpha Lipoic Acid, Larch Tree Arabinogalactan. Below are reviews of TERRANOVA Lutein 20mg Complex - 50 Vegicaps by bodykind customers. If you have tried this product we'd love to hear what you think so please leave a review.